joy magnetism: Hot dogs! Get yer dogs right here! Hot dogs! Get yer dogs right here! 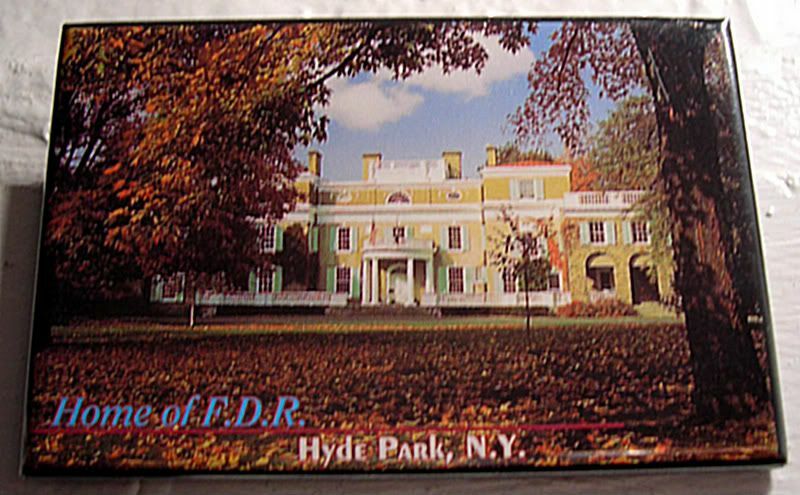 Springwood was the home of FDR up at Hyde Park. As you can see, it wasn't a tiny home, either. It used to be a farmhouse at one point, but then the Roosevelt family made it into a stately home. When you visit, they take you through several of the rooms, where you see FDR's stuffed bird collection, the room where he was born, the rooms where he grew up, where he did his work, and the elevator he had created to get up and down from floor to floor. What's always fascinated me more though, is visiting Top Cottage, his little rustic getaway a couple of miles away. You can only visit via the shuttle bus, but I just love going to Top Cottage because a lot of history happened up on that hill. And yet, FDR never spent the night there. You can tell that the cottage was designed (by FDR) for entertaining, because the living room is a massive open area, opening out to a terrific little front porch that overlooks a little valley, while all of the other rooms are small and fairly spartan. A few events happened out on that wooden porch. There's an infamous story about how King George VI and Queen Elizabeth visited the US in 1939. They did a little tour around the States, visiting the World's Fair out in Queens; Trenton, NJ; Washington, D.C.; Niagara Falls, etc. And it was a very big deal - never before had a British monarch ever set foot on U.S. soil. FDR needed to build up relations with the UK, and after the King accepted the invite, FDR meticulously planned every moment of their itinerary. Crazy. But all of that is not what made that visit infamous. Nope. It's that FDR invited them out to Top Cottage for a good old-fashioned American picnic. And fed them hot dogs! By all accounts, their Majesties loved the hot dogs, and Americans were torn between being totally appalled or proud to be an American. Even his FDR's own mother was a little freaked out over it. There's just something funny about the thought of FDR explaining how to eat a hot dog to a prim and proper King and Queen. They sell bears there, don't they? Sorry, but my dance card is full. It's a great, big beautiful tomorrow!